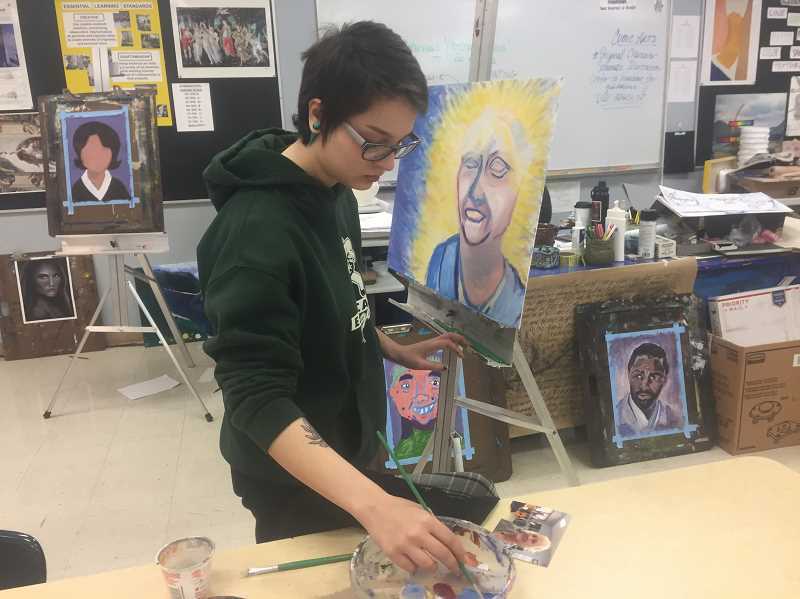 Art students at Estacada High School have combined interviews and portraits to produce snapshots of life in a small town. Students in Janice Packard's drawing and painting classes worked with Packard and guest artist Reeva Wortel on the project, during which they interviewed a variety of people around town about their experiences in Estacada. Next, they drew or painted portraits of their interviewees. "(We're looking at) how to cultivate themes about small towns," Wortel said. "Who are we? What's interesting? What misconceptions about small towns are there?" The completed portraits, along with quotes from the interviews, will hang at Estacada City Hall beginning later this month. There will be a reception for the show from 6-7 p.m. Thursday, April 19, at City Hall, 475 S.E. Main St.
One person interviewed for the project was Estacada Mayor Sean Drinkwine. "He talked about how the town has grown and changed," Wortel said. Themes of life in Estacada that came up during the interviews include nature and friendliness. Students enjoyed the interview element of the project. "It's cool we got to meet the people we're painting," said Alexis Patterson. Rosie Shaver noted that her mom was one of the people interviewed, which she found enlightening. "I learned a lot of new stuff about her childhood, and it was fun to re-hear things and look at everyone else's reactions," she said. Wortel sees value in helping students engage in a community-centric art project. "It's focused on the community, asking the community questions, learning about the community and reflecting that back at the community," she said. She added that the work has also been helpful in allowing students to further refine their listening skills. "Students have really challenged themselves to listen to different perspectives. We talked to all of these different voices and different perspectives on small town life," she said. Packard added that connecting with people like this adds another dimension to the art. "Arts are driven by emotion," she said. "To have students connect with their subject on a personal level is important for when they do the portraits. They can pull up the emotions that they felt during the interview and feed it into the portraits." Wortel noted that face-to-face conversations like these don't necessarily happen regularly. "In the modern age, so much is on computers and cell phones. One student said, 'this is kind of old fashioned,'" Wortel said.